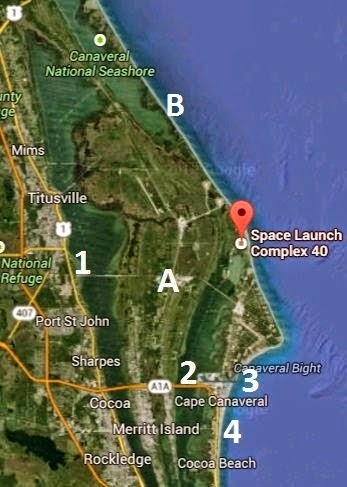 CAPE CANAVERAL, Florida -- Here are the best viewing areas in Brevard County available to the public to watch a SpaceX launch from Space Launch Complex 40 at Cape Canaveral Air Force Station in Florida. B. The Canaveral National Seashore is only open from 6 a.m. to 6 p.m. Therefore, only use this location for viewing launches that occur within that time window. Admission is $5 per car. 3. Port Canaveral has waterfront restaurants with free parking that offer a good view of the launches. There is also viewing available with paid parking inside Jetty Park. 4. Along the beaches of Cape Canaveral and Cocoa Beach, Florida (there is metered parking in Cocoa Beach that only accepts quarters, so bring some change). Cape Canaveral prohibits parking at the beach accesses during night time hours.